This column was written byCBS News Early Show co-anchorHarry Smith. 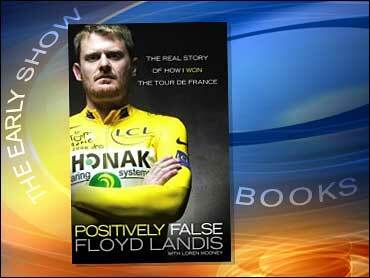 Positively False is the title of the book just out today by Floyd Landis. There, on the cover right next to a picture of Floyd in his yellow jersey, are the words, "The Real Story of How I Won the Tour de France." Just days after Landis' victory, he was accused of cheating. A French lab found an elevated level of testosterone. Landis denies wrong doing, and has fought through an arduous arbitration hearing, the results of which may be known in a matter of days. In his book, Landis lays the foundation of plausibility, if not downright believability. Discipline, hard work, and research went into the victory, he says. The wins he had running up to the tour were no fluke. Full disclosure is what he claims in his book. He attacks the testing procedures, labs, Cycling Union, and the U.S. Anti-Doping Agency. It's pretty compelling. Skeptics will scoff, though. Bike racing is notoriously dirty and Landis' positive test result came after his remarkable come-back high in the Alps. Positively false, or too good to be true?